Australia is a country more synonymous with iron ore, copper and gold as opposed to metals such as lithium. But all that could change as a group of Australian junior explorers pursue their goal of revolutionizing the entire lithium industry through cutting-edge technology, first developed by an Aussie team of metallurgists. The company that is commercialising this technology and leading the charge is Lithium Australia (ASX:LIT). Previously Cobre Montana, the company recently underwent a name change to Lithium Australia to better reflect its business of lithium processing and production. 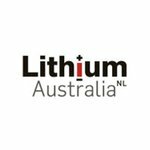 LIT has just released results of a 10 day continuous processing trial, demonstrating it can produce lithium carbonate to 99.57% purity – just the thing lithium-ion battery producers need as they look to ramp up production over the coming years, on the back of a surge in electric cars and home battery power storage. 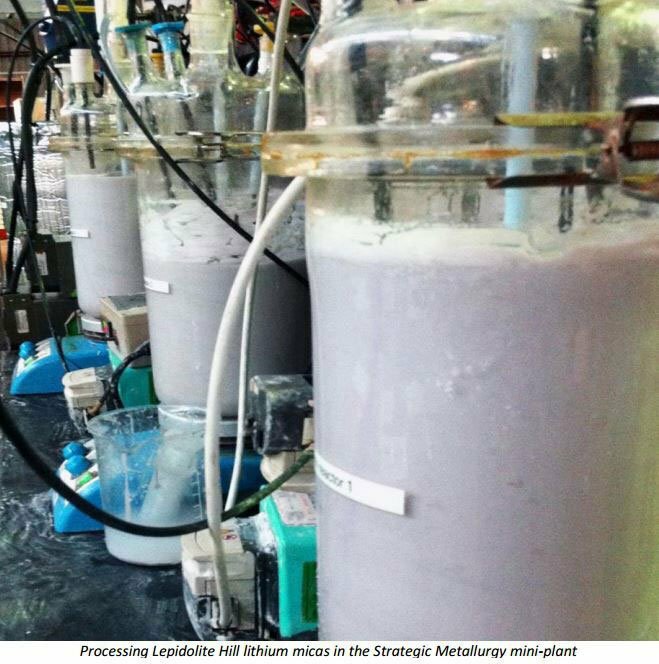 The 10 day trial was a world first – not only has LIT been first to achieve successful, continuous, lithium extraction using hydrometallurgy on hard rock, but the 10 day trial is the second time LIT has done it – no small feat. The next step is a commercial evaluation of the lithium carbonate by potential buyers – meaning that very soon LIT will be making samples available to end-users/traders to ensure the product meets their requirements. 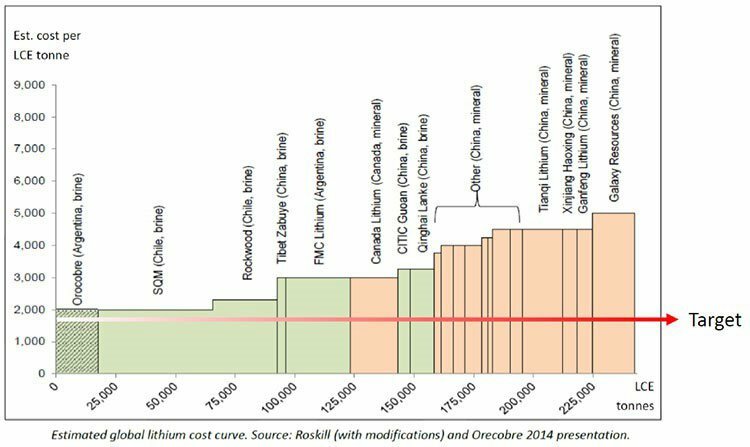 Critically, LIT’s process is cheap – it’s targeting production costs of well below $2,000 / tonne of lithium carbonate produced, which is competitive with brine producers. Lithium carbonate sells for around $6,000/tonne, so there are strong margins if LIT can commercialise this technology. LIT remains a speculative stock and caution should be advised when considering as an investment. In our first article on the company, ‘ ASX Company to Dominate Global Lithium Market? ’ we went into great detail regarding LIT’s operations, game plan and future potential in this still blossoming niche market sector. Here’s a link to coverage of LIT from ‘ Industrial Minerals ’, which also covers the recent testing results. The Aussie mining boom may have slowed to a walking pace for the time being, but in a broader sense, Australia continues to possess a substantial inventory of raw materials for a wide range of commercially viable applications. Companies that take advantage of upcoming shifts in preference such as the wider use of lithium batteries, are likely to benefit from any lithium boom that occurs. With the aid of its novel ‘L-Max’ technology, exclusively licensed to LIT by Lepidico for all of Western Australia and two other locations globally, LIT has the potential to define one of the largest hard-rock lithium deposits. This can be accomplished by applying LIT’s exclusive rights to apply L-Max to the giant Cinovec deposit in the Czech Republic. The corporate side of the transaction has been sealed by way of a non-binding Heads of Agreement with European Metals (ASX:EMH) owners of the Cinovec deposit which is headed towards a 50/50 JV, with LIT managing the lithium production. If its European play doesn’t pan out, LIT has strategic partnerships with other explorers as safety nets, including Pilbara Minerals (ASX:PLS), Focus Minerals (ASX:FML) and Tungsten Mining (ASX:TGN). The ultimate goal is to obtain access to an abundant supply of lithium mica, preferably in the form of tailings so as to be able to produce with no mining cost. Essentially, LIT is searching globally to establish long-term, reliable production of lithium carbonate on a commercial scale. Developing strategic relationships that can deliver those attributes. LIT is also investigating primary lithium mineralization, in deposits not previously mined, which might meet the relevant commercial hurdles. LIT has secured exploration locations for itself as well as forming joint-venture agreements with key players that are can provide suitable raw tailings material for LIT’s L-Max process. Currently, LIT is involved in 6 distinct projects, in both Australia and Europe. The highest priority venture is the Cinovec Project given its immense resource potential. LIT has partnered with European Metals Holdings Limited (ASX:EMH) with a view of establishing a 50/50 joint-venture later in the project’s development. Cinovec contains an inferred resource of 515 million tonnes at 0.43% Li 2 O (0.1% cut-off) with an additional exploration target of 350-450Mt @ 0.39-0.47% Li 2 O possibly to be confirmed in the coming months. It’s worth mentioning that LIT’s/EMH’s Cinovec mineral resource estimate was significantly upgraded back in February 2015 on the back of the L-Max Process. 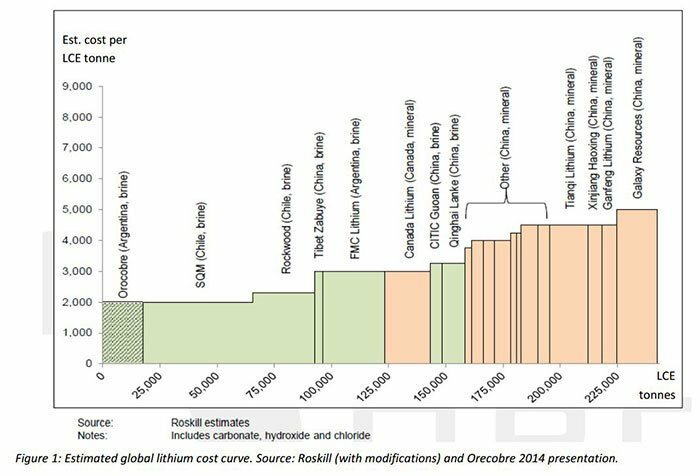 This was a mighty shot in the arm for LIT and could be the first of many such resource upgrades amongst other lithium explorers over the coming years. A Scoping Study on the Cinovec deposit was recently completed by EMH which is preparing to list on London’s Alternative Investment Market (AIM) within the coming months. EMH is progressing the project alongside LIT (exclusive technology licence holder), and Lepidico as the technology watchmen. You can read further about EMH in our recent article on the company: Lithium Project Fast Tracked by EMH: World’s Biggest Hard Rock Resource? Lepidico , purchased the rights to L-Max from technology developer Strategic Metallurgy which maintains a close working relationship with LIT as part of ongoing test work and process tweaking. This Pilgangoora Lithium-Tantalum Project has Indicated and Inferred resources with a corresponding lithium resource of 20.48 Mt @ 1.16% Li 2 O, containing 237,000 tonnes of lithium oxide. The resource features conventional spodumene mineralization but historic records suggest Lepidolite (one of the lithium micas) may be abundant in areas not drilled to date by Pilbara to date. Under the terms of the agreement between Pilbara Minerals and LIT, LIT will assess the potential of lithium micas and put a commercial development proposal to Pilbara Minerals. LIT has partnered with Focus Minerals Limited (ASX:FML) on 80/20 split in LIT’s favour. 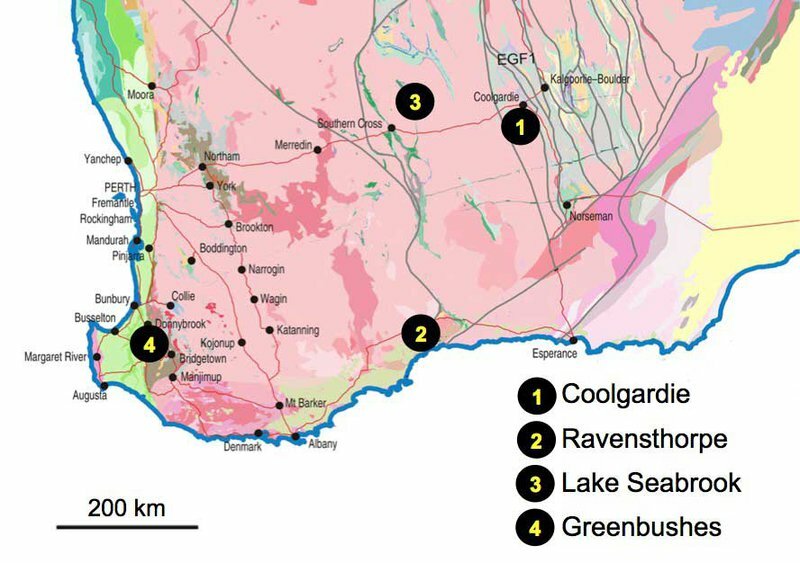 Focus Minerals is a gold explorer but LIT’s interest lies in areas of pegmatites 15km south of Coolgardie. Prior mining at Lepidolite Hill has generated over 400,000 tonnes of lepidolite-rich material which LIT has subjected to L-Max. The results were positive , corroborating the potential of L-Max as a proof of concept. LIT owns 100% of this project, acquired in February 2015, near the Mt Cattlin lithium project owned by Galaxy Resources (ASX:GMM). 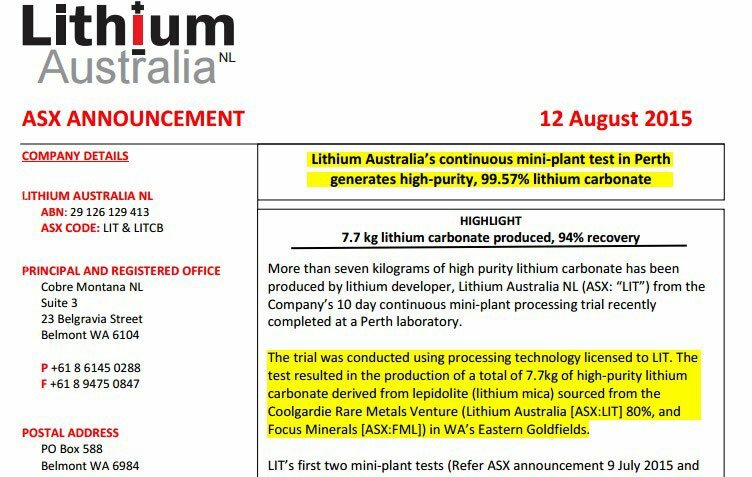 Ravensthorpe is not LIT’s prime focus although samples of zinnwaldite and lepidolite are being prepared for leach testing and lithium carbonate production. LIT is also undertaking geochemical surveys as part of its exploration strategy. Greenbushes is next door to the world’s largest lithium mine, operated by Talison Lithium. At present, Talison produces more than 30% of the world’s lithium supply and accounts for 75% of Chinese demand. The project is subject of an exploration licence application that covers a 50km structural trend containing pegmatite swarms with close similarity to Talison’s. LIT retains 80% of the project with 20% in private hands. LIT has partnered with Tungsten Mining NL (ASX:TGN) on a 80/20 split in LIT’s favour on this Project in the Eastern Goldfields. The JV recently received news of an exploration license granted here, which doubles in size the project’s footprint. This new ground will allow LIT to explore new pegmatite targets, of which LIT will focus on the most prospective. The thrust of LIT’s strategy here is to turn ‘geological curiosities’ into lithium chemicals – and the expansion of the Seabrook Rare Metals Venture is part of that advantage. The alluring thing about this technology is that it is capable of processing redundant ‘waste’ material obtained as a by-product of other mining operations. The waste streams emanate from tin and tungsten production, spodumene (conventional hard rock lithium) production, and a range of other industrial production sources. The fusion of technology with these waste materials creates one of the most valuable compounds in the commodities space today – lithium carbonate. 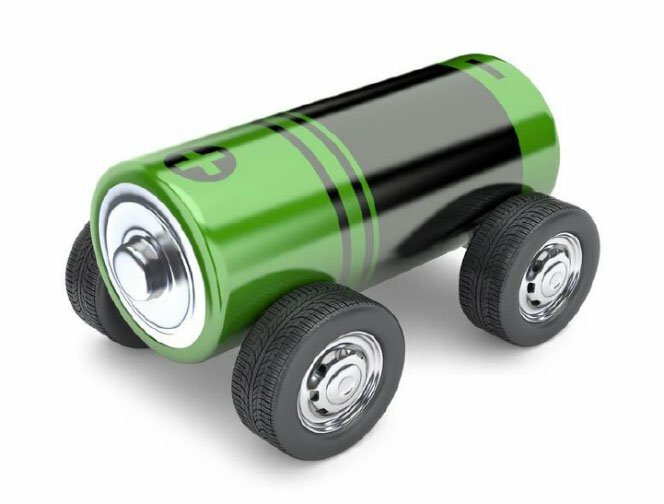 High grade lithium carbonate is used in a variety of ways but its most compelling use is probably in lithium-ion batteries, which stand on the verge of changing our energy consumption patterns forever. Companies like Tesla, LG Chem, Foxconn and BYD have come onto the scene just recently and introduced much more efficient ways of STORING energy within batteries, with that energy then summoned upon request to be used in people’s homes, electric cars or fed back into existing power grids. 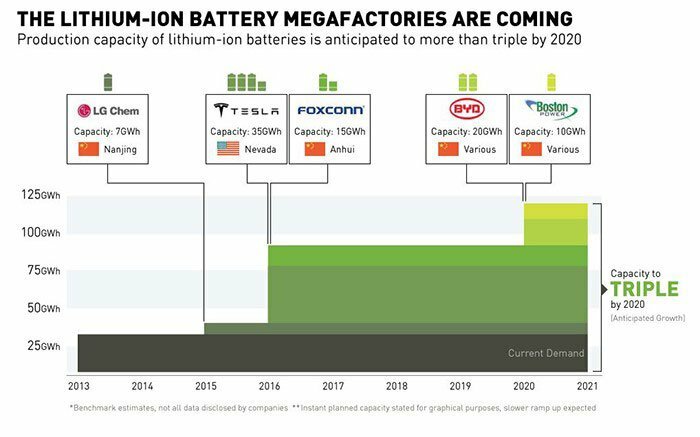 The chart below shows just how much lithium-ion batteries are set to dominate over the next 5 years. 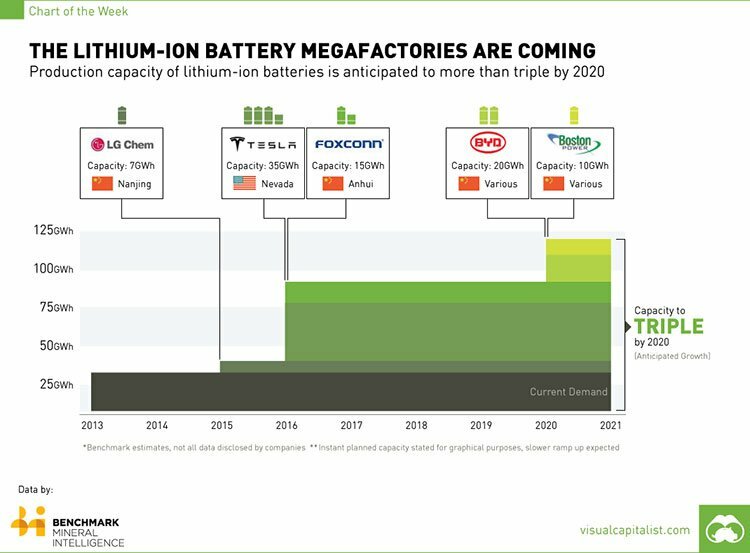 By 2020, lithium-ion battery production capacity is expected to triple from today’s levels of around 25GWh. And it’s not all that surprising to see Chinese companies leading the charge given China’s huge (and growing) energy consumption, and its dominance in the lithium market. The renewable energy boom hasn’t exactly fizzled out but its thunder has been stolen by a more commercially viable energy storage industry that can make better use of existing solar panels, and other renewables such as hydroelectric power. For LIT, this presents an immense opportunity to commercialise the vast amounts of lithium mica raw material available globally – either via its own exploration and mining operations, or as part of joint-venture agreements based on patented intellectual property rights. At the same time, LIT is an early stage company, and success is no guarantee. As with any resource commodity, grade is king. In the case of lithium and LIT, purity is paramount. LIT is able to achieve a recovery rate of 94% from leach liquor to carbonate production. These are very optimistic initial results so it’s not time to open the champagne just yet. There is still more test work to do but to record 99.57% purity with a 94% recovery rate is an excellent start. This means LIT can manufacture a product to some of the highest purity around on the market and therefore, command the highest sale prices. As LIT tweaks its L-Max process in partnership with Lepidico , we could (and should) see LIT improve on its purity and extraction efficiency over time. That’s great news for LIT – still a sub-$10M-capped trailblazer undervalued in comparison to its peers. In the past the onus was on heat-intensive ‘roasting’ whereby lithium carbonate was literally blast furnaced into an expensive existence. Nowadays, courtesy of Lepidico and the L-Max Process, lithium carbonate can be derived with a zero-energy footprint therefore making its production faster, safer, more efficient and more commercially lucrative. Compared to the other major lithium players globally, LIT is on target to enter its market ahead of the field. One of the most compelling aspects to LIT’s technology is that it can even produce lithium at a discount to traditionally cheaper brine producers. We certainly see a bucket load of potential at LIT although the company will have to plot a prudent path through its next steps before its commercial future is fully secure. LIT is still a small company and a speculative investment. Currently, LIT is accumulating enough finished product to distribute to end users such as lithium battery manufacturers. It is expected that end-users will be more than satisfied given the 99%+ purity LIT is able to achieve. If LIT’s L-Maxed lithium carbonate continues to be substantiated by further testing and trials, we could see LIT corner the lithium marketplace because unlike other producers, its source material is not an ore body but rather lithium tailings that are abundant globally. This ensures that regardless of market conditions, LIT is likely to have an ample amount of raw material to produce its high grade lithium carbonate. In terms of commercials, LIT is well on its way to defining one of the largest mica deposits in the world – at Cinovec in the Czech Republic with EMH. Already home to 515 million tonnes as part of EMH’s project, LIT’s prospective 50/50 joint-venture could be the huge resource LIT is looking for. We will know more in due course as EMH progresses with its exploration and a London AIM listing later this year. The smart money seems to be strategically positioning itself based on expectations that lithium will be a major commodity over the next 10 years. $10M-capped LIT is well positioned to ride the coattails of a possible multibillion dollar lithium boom that reinvigorates Australia’s mining sector as a whole.